Ever wonder how we came up with designing THE M? Well, let’s get to know THE M first. THE M is a unique piece of furniture that can be transformed according to mood, lifestyle and need. It can be used as a couch, a daybed, a lounge chair or outside on a terrace. You can even use it as a cozy and elegant headboard for a bed. The leather straps make THE M easy to move around and shape according to mood. They also serve as loops for wall mounting if used as a headboard. 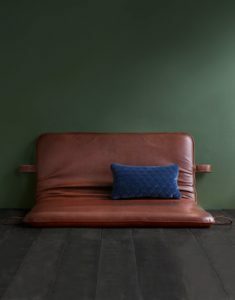 Made to look like the original gym mat introduced in gyms all over Europe and at the Olympics in the mid-1930s, THE M has been redesigned and reinvented in the finest aniline leather. When our Chief designer and founder Mads Thornam started out designing THE M he wanted to reinvent the way in which we see and use furniture. He aimed for a design that would instantaneously sooth the mind. He wanted it to be cozy, homely and luxurious. He obtained the original sketches, drawings and rights to revive and redesign this unique design icon from scratch, but even though it was important for him to stay true to the original he totally redesigned it. The curves, the stitches, the padding, the handles, the use of leather have all been creatively reinvented to embrace modern Scandinavian design. Like the original THE M comes in 180x110x8cm/71x43x3in. You can choose to get it in full leather on both sides or with leather on one side and textile on the other. Both of these versions can be turned. The one with textile on one side and leather on the other even gives you the ability to change between two totally different looks. THE M also comes in versions that are not meant to be turned. If you choose the leather version, it will have leather on one side and partial leather and black colored textile on the other side. From the front, you will not be able to see the difference, just as everything else from the padding to the handles is the same. THE M can be used as a headboard but we have also designed a version that is solely meant for being used as a headboard. While THE M rests on the floor behind the bed the special headboard versions rests on the top of the bed frame or mattress. It comes in various sizes. Along with the headboard you can choose from different hangers to match your style. Please use our contact page for special inquiries and wishes. THE M is made in the finest handpicked aniline leather. It can be combined with some of the finest textiles in the world. Like the original the appearance of the leather will age with beauty. Usage, daylight and interior lighting affect the leather. Through time it will develop its own unique characteristic and amazing patina. THE M is meant to last generations. There have been no compromises and the use of leather is unique. Never before have a piece of furniture used that much aniline leather on such a big surface without any seams disturbing the eye. Every hide has its own unique story and characteristics. The padding consists of 3 different kinds of foam that have been handpicked and combined BY THORNAM to make THE M comfortable, durable and adaptable. Get a closer look at the fabrics and the leather. The Hague Agreement governs the international registration of industrial designs. First adopted in 1925, the Hague Agreement establishes an international system – The Hague System – that allows industrial designs to be protected in multiple countries and regions.